It’s been some time since I tasted a sake from Fuji-Takasago Brewery in Fujinomiya City. Since September is the time to taste the Hiyaoroshi sake/sake taht has been sterelized only once, it is such an embarrssment of choices, but I opted for this brewery as it is slightly unusual in Shizuoka refecture. The real title for this particular sake is “Takasago Yamahai Shikomi Junmai Shu Hiyaoroshi Namatsume”! Meaning: Takasago (main name) Yamahai Shikomi (old style brewing) Junmai Shu (Junmai=no alcohol added) Hitaoroshi Namatsume (bottled without a second sterilization. 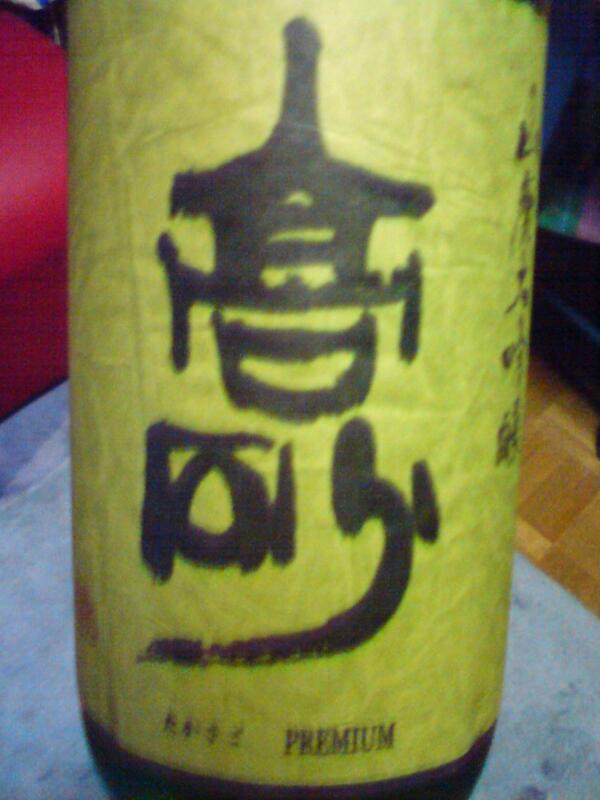 On top of this it is a genshu/no water added! Taste: Strong attack with a lot of junmai “petillant”, sweetish. Complex: Macadamia nuts, bananas, oranges, vanilla. Warms back of the palate for some time. Lingers for a while with very dry almonds backed up by oranges and vanilla. Sweet by Shizuoka standards at first approach but dries up quickly. Overall: A sake that can be greatly enjoyed chilled or at room temperature. Great as a sweetish aperitif or in lieu of a port wine. Strikes a great marriage with choclate or blue cheese. Chilled, can be drunk as a dessert drink! Would do excellently poured over ice-cream! Fuji-Takasago Brewery certainly makes for long titles! Located in Fujinomiya City, it is not truly a completely local brewery as it has been absorbed in a bigger conglomerate of the same name. On the other hand, regular staff are local and the concept of sake brewing is very much according to the Shizuoka tradtion and tastes. This particular bottle is pretty rare as only 30 (720 ml) of them were made before the rest of the batch was modified with water and more sterilization. 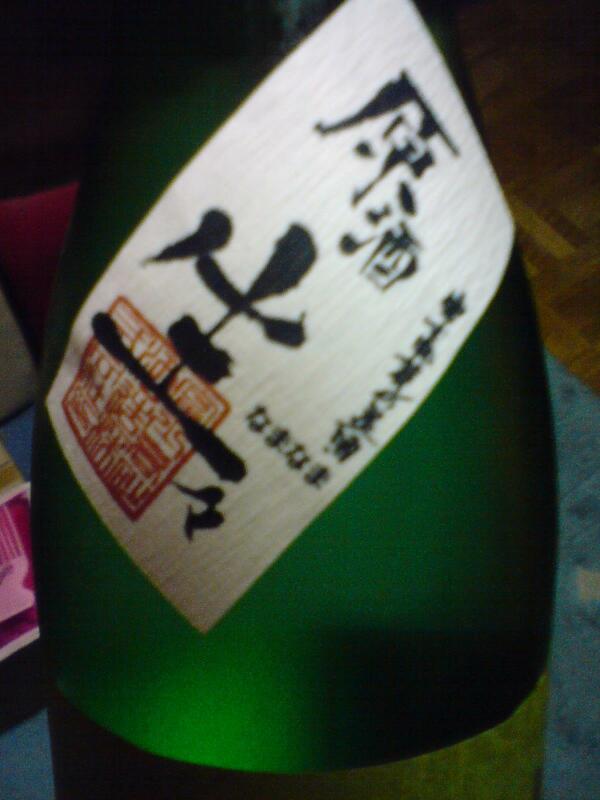 The sake was brewed according to the Yamahai method. Although it is not a junmai (alcohol was added), it is a genshu, meaning than no pure water was further added to lower the alcohol content. Moreover it is a “nama”, meaning unpasteurized. Aroma: Fruity, complex, fleeting, Pineapple, coconuts. Taste: Sweetish attack. Turns dry and deliciously acid very quickly. Complex. Cherries, coconuts, mirabelles, pineappple. Fades away very quickly with notes of bitter choclate, apricot, coffee beans and dry almonds. Surprisingly mild for such a high alcohol content. Holds its own so well with any food. Overall: Surprisingly elegant for a Yamahai. No wonder so many breweries in Shizuoka are tackling this kind of sake judged “rustic” in other Prefectures. Shizuoka yeast influence? Another sake for all seasons, to be appreciated at all temperatures on its own or with food, chilled, at room temperature or “nurukan” (40~45 degrees)! Who said (in Tokyo?) that honjozo were for the locals? If that is so, I am extremely proud and pleased to be considered one! Taste: very fruity at first: lots of strawberries. Varies shrply and turns complex with food. Almonds/bitter chocolate wit a hint of acidity. Overall: A sake for all seasons. Can be drunk chilled with a reminiscence of ice-cream. Lots of fruit. The strawberries taste is quite a discovery! The brewers actually suggest to drink it from on the rocks to nuruma! I was told that the owner of Fuji-Takasago Brewery had a soft spot for French wines, hence the name “Soleil/Sun”! He went as far as mentioning: “Mis en bouteille par Fuji-Takasago syozo et Cie Fujinomiya Shizuoka, Produit de Japon” (only one small mistake, LOL). A very extravagant sake, I wonder if the Shizuoka Geeks realized they were drinking nectar! Lingers long in mouth with more strawberries and flowers/coffee beans. Bitter chocolate appears with food. Overall: Elegant. Very easy to drink. A session sake, although perfect with food! Takasago Junmai Nama Genshu (Fuji-Takasago Brewery, Fujinomiya City). Taste: Complex. Welcome tingle due to its “nama” and “genshu” nature, which spreads very quickly through the palate. Bananas, gardenias. Overall: Solid and satisfying. Very popular with ladies in spite of its strong nama-genshu character. A sake to go with any food. Tasting can either become a heavy load on your liver or on your purse. I usually acquire 720ml bottles, but whenever I can grab those 300ml flasks, I don’t hesitate as they allow me to go through a lot of brews and limit myself to one sample a day. Thinking there are well over 300 brews to taste, I have no worries about psoting articles! The only indication about rice was that is was milled down to 58%. 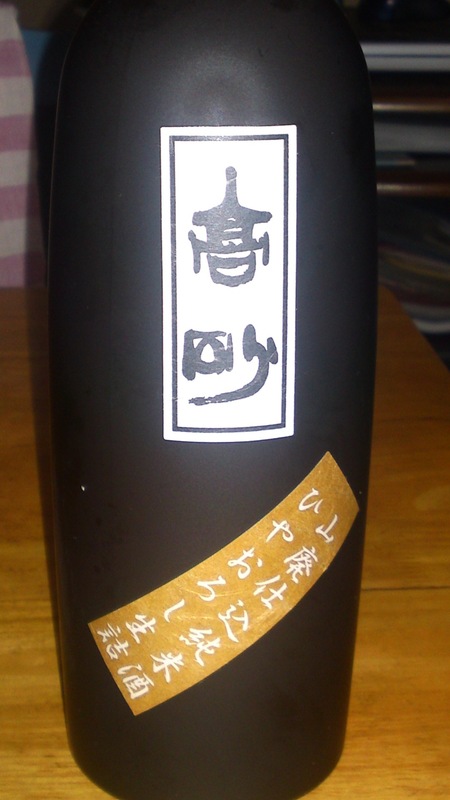 For once, I tasted a sake brewed in the Eastern part of Shizuoka Prefecture, more precisely from Numazu City. By pure coincidence the sample was introduced in the Dancyu Magazine, April 2007 edition, as a typical example of “Yamahai” (cold brewing) sake. Aroma: Light flowers, fruit, discreet and elegant, almost shy. Quite light flavour for such a style of sake avoided by many brewers. Taste: Apricot/banana/almond. Easy and smooth on the palate. Leaves a strong “petillant” after swallowing. It could be considered a macho sake in Shizuoka Prefecture, but would probably please ladies in other parts of japan, too.